Source of title proper: Title based on original document title. 0,02 m of textual records. - 1 map. 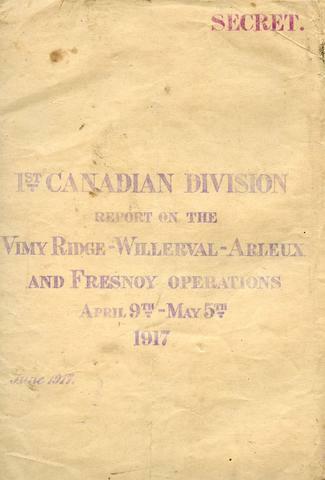 The record consists of a Report on operations carried out by the 1st Canadian Division between April 9 and May 5 1917, specifically regarding the Vimy Ridge-Willerval-Arleux and Fesnoy operations. The record also contains General Sir Arthur Currie’s after action report on the Vimy Ridge operation. For use and reproduction terms, please consult the Archivist. A full transcription and detailed information regarding this document is available on the BCHS website: General Sir Arthur Currie’s After Action Report on the Attack on Vimy Ridge, with Commentary by Robert Paterson (http://www.bromemuseum.com/onlinepublication/).